JCU has won a top international architectural award for its ground breaking Townsville education and student services building, Education Central. The Council of Educational Facility Planners International (CEFPI) in Portland, Oregon USA has awarded Education Central a “Project of Distinction”. About 60 educational projects from around the world vied for the award – just nine have won the prize this year. It’s the third major architectural award Education Central has won this year. 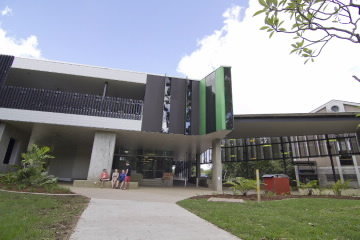 In May, the building won CEFPI Australasia’s award for the overall major new education construction project. In June, Education Central won the Walter & Oliver Tunbridge Award for Building of the Year in the Public Architecture category at the Australian Institute of Architects National Architecture Awards. Professor Nola Alloway, Dean of JCU’s College of Arts, Society and Education, said the University is proud to win a ‘hat trick’ of top architectural awards. She said the latest award reflected the outstanding collaboration between the architect and staff in the School of Education. 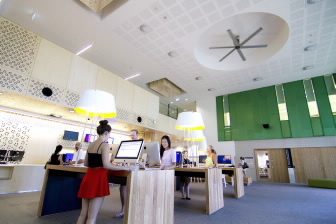 “JCU teaching staff worked with the design team to create a building that improved student services and supported modern methods of teaching and learning,” Professor Alloway said. The multi-million dollar, two-storey development opened in 2013 and was designed by Wilson Architects with Architects North. The facility includes large-scale active learning spaces that support technology-enabled active learning (TEAL) areas that are spacious, well appointed and flexible.